With improvements in Video Editing apps available there’s now some great options for editing your content right on your device, making it the ultimate tool for creating videos on the go. 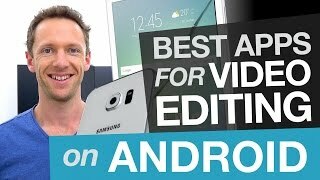 I’ve tested a TON of android video editor apps, ranging from the simplest template-based apps that automatically generate videos from your footage, to full-blown editing solutions with timeline and multi-track support. Until recently, my biggest gripe has been how overly simplified these apps have all been – there was no real option for true ‘editing’ I was really happy with. But that’s changed. There are now several apps that give you a full editing workflow and all the basic customization tools you need, right on your Android device. In this video, we run through my two best recommendations, after testing out and working with a ton of different apps! Do you still recommend these two? I see this video was published ’16. Thank you! Have u tried luma fusion on ipad? How can I add a song with my pic please i was looking for a videos to help me and I asked u please make a videos and I will watch it please. thanks Bro Powerdirector is Best App for me Thanks !!! so wishful thinking but is there a free one that doesn’t watermark? Perfectly presented! You get straight to the point and don’t waste much time like many other reviewers who constantly input their personal opinions more than talking about the features and advantages/disadvantages of the product or service they are speaking of. Greatly appreciated. So you can sum this up to one sentence. If you wanna do decent mobile video editing you need an iPad and Luma Fusion that costs about 22 Euros. Once, not monthly. Yes i love powerdirector. I use it on my samsung phone. So i paid to use it in my laptop but i find it different and hard. Now im regretting. Am i doing anything wrong? Does anyone know the best ones for a Samsung galaxy note 4? This is helpful though because it is an android. EDIT : OK. I’ve seen the cyber link one. Can I ask how to film on a computer??? PowerDirector is now subscription-based, which works out to about $20 per short video clip for me — not a good value for casual use. They do have ActionDirector on the old pay-once for unlock model, apparently. Justin, do this app have a time length limit? I ask cause I’m looking to shoot a 45 min video. well I cheated..I dont remove the watermark..I just download du recorder for recording your screen, there is editing tools too in that app….so I make an edit on power director/kinemaster then I save it..after that I edit the video again in du recorders crop the the watermark part…so there’s no watermark.. I had zero editing or videography experience 3 months ago & please understand, I’m not boasting here. I just want people to know just how excellent the Aps ya’ll suggest here are spot on! Every video on my channel, a brand new channel, were done using Power Director and using only my Samsung Galaxy S7 until recently I added a micro cam to my gear & yes I spent $5.95cdn for the version I have so get rid of the watermarks etc. But PD also allows the user to create their own watermark as well, I just uploaded what I wanted & YT ads into my videos for me. I,m saving funds for better video gear but I also just downloaded Kinemaster & am trying it out as well. I can use either Ap to make my videos now but Kinemaster is more pricey @ $8.50 cdn/mth & I think the new gear is where my funds will go 1st then I’ll shell out for a yearly rate for the Ap. Point being, your video is describing me exactly & if your Subscribers want proof, have them visit my channel as I said, 14 videos that get compliments on a regular basis from a guy who had zero experience. I bought Power Director before I found your incredible channel but everything ya’ll say here is 100% true. Your channel is simply my first & often only source needed for any help I need, I can’t thank ya’ll enough for everything ya’ll do to help new Creators such as me!! Thanks so much for all your excellent advice, suggestions, etc in every amazing video ya’ll share. PowerDirector and ActionDirector are unable to find on-device source video clips in subdirectories beneath …/Pictures or …/Movies. This requires copying large files instead of referencing them. Pretty much a show-stopper for reasonable workflow on a portable device. Why does apple have to be so awesome?! hey mate just a quick one does these two apps still the best in 2018? Do the apps allow you to add picture effects such as raindrops, etc?